Powers/Abilities: 21 Black Jack has no known superhuman abilities. 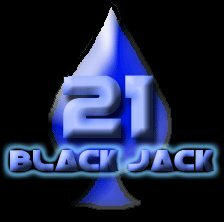 21 Black Jack possesses the strength, speed and stamina of a man his age who engages in regular intensive exercise. He is highly trained in various forms of hand to hand combat and has an extensive knowledge in the use of a variety of weapons and firearms. History: Tyrone Blade was once one of the most gifted demolitions experts the United States Marines ever trained. Blade earned a Congressional Medal of Honor during a mission into the heart of Viet Nam to rescue POW's who were still being held by the communist government. After his tour of duty was complete, Blade joined the Orleans Parish Sheriff's department. Once again, Blade showed his strength and became a lead detective in Robbery/Homicide. 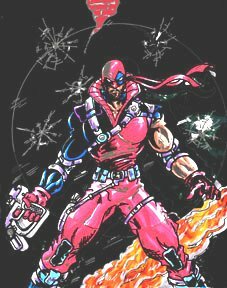 Blade was approached by agents of the FBI to assist them in an on-going investigation into the activities of an alledged crime boss known as Master Midnight. Blade went deep undercover and became a trusted member of Midnight's operations. However, Midnight's moles within the Department of Justice informed him of Blade and of his mission. Midnight became furious and ordered that Blade be made to suffer. Midnight came up with a plan, thinking that since Blade wanted to live among criminals so badly, he would arrange it. Midnight personally slaughtered Blade's entire family and had Blade himself framed for the murders. Using his influence within the Department of Justice, Midnight had Blade convicted and sentenced to death by lethal injection. Blade sat on death row for ten years, continuing to proclaim his innocence, but he also became consumed by hatred and revenge. On the day of his execution, a mysterious government agent named Smythe approached Blade and offered him a chance for redemption and a chance to get revenge on the man that put him on death row, Master Midnight. He told Blade about the Black Jack Project and how he would become the 21st agent of the highly specialized task force designed for the sole purpose of hunting down and eliminating potential and known terrorists. He would be equipped with the governments most sophisticated weaponry and technology. If he went on several key missions, they would provide him with the information on the whereabouts of Master Midnight. Blade accepted the offer. Agent Smythe arranged the televised 'execution' of rogue officer Tyrone Blade. Ater the mock execution was over, Smythe took Blade to a secret underground installation deep in the Louisiana bayou. Blade assumed the name 21 Black Jack, since he was the twenty-first member of the team, and also because of the 'spade' tattoo that he got over his left eye while in prison. Once equipped with a mobile arsenal, 21 Black Jack began his one-man war on Master Midnight and his operations. Comments: Created by Wm. Joseph Warner. Text covering origin and powers taken straight from the Worldwinz Studios site. Thanks to Wm. Joseph Warner for informing me of this character and pointing me to the site.